Chemical peels are not something new. In fact, Cleopatra is one of the most famous users of skin peeling because she used to bathe in sour milk. The lactic acid produced by the sour milk is still used today in many chemical peeling formulas. While there are a number of acids that can and are used these days for a chemical peel, glycolic acid, originally derived from sugar cane, is the most popular and safest of all. There are several reasons why glycolic acid is the most popular of all alpha hydroxy acids (AHAs). First of all it is extremely effective. It is explained by the fact that it is the smallest of the alpha hydroxyl molecules, therefore the most active. Second, it has very few side effects even when used in strong concentrations. 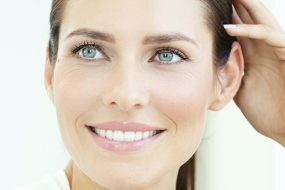 Several studies have proved the merits of glycolic acid in reducing fine lines and wrinkles, improving skin tone and hydration, and promoting the production of new collagen. It is also known to greatly benefit acne sufferers.The effect will vary depending on the strength of the peel. The deeper the peel, the more extensive your skin renewal. People often think it is important to have a higher percentage of glycolic or another active peeling agent however the key is the pH- the lower it is the deeper the penetration. The pH determines the acidity or alkalinity of a chemical solution. As the pH becomes lower the acid’s intensity or strength increases. The efficacy of an AHA is dependent on its concentration and the pH value of the formula. Following a peel with a lower pH, it is important to then look after the skin by repairing and hydrating thus bringing the pH of the skin to a normal level. In order to be effective, an acid needs a lower pH than that of the skin, which falls between 4.5-5.5. For the ultimate wrinkle lift, look for a peel that contains a blend of glycolic and retinol. This works to visibly reduce the appearance of fine lines and wrinkles, leaving the skin firm and revitalized. The glycolic also acts as a catalyst for the retinol allowing it to travel through the layers of the epidermis into the dermis. For acne sufferers, it is important to look for peels that contain blends of alpha and beta hydroxy acids, and that also contains anti-inflammatory agents to effectively treat and heal the acne lesions. It is important to have this blend of AHA and BHA as one works more superficially removing dry crusty skin enabling better penetration of active ingredients for healing and cellular renewal and the other works deep within the blocked follicles dissolving oxidised sebum plugs that form a blackhead. Vitamin C (healing antioxidant), comfrey and chamomile (anti-inflammatory) are key extra ingredients that not only make a peel more versatile and adaptable for many different skins conditions, they help aid the acceleration of skin healing, reducing erythema, and increasing the synthesis of collagen and elastin.